WallHound™ detects and deters individuals from using mobile phones in areas they are normally restricted, unauthorised or illegal. 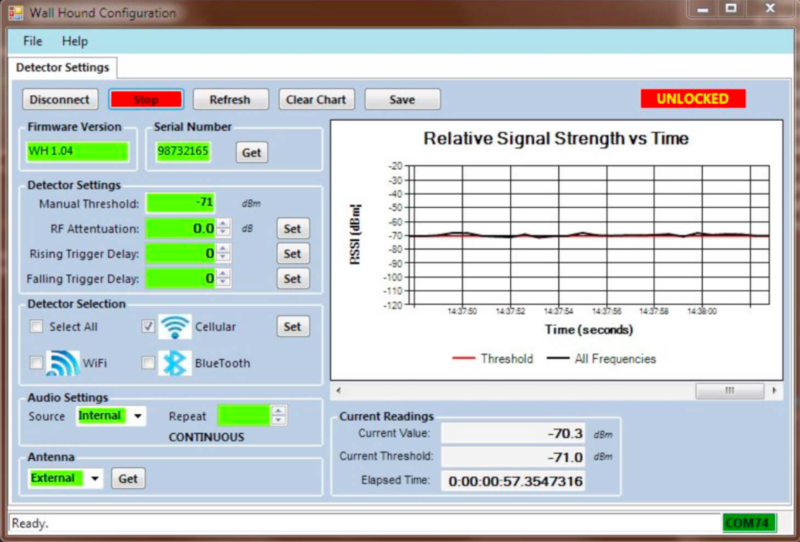 It works by detecting all nearby mobile phone activity including voice, data and texting. 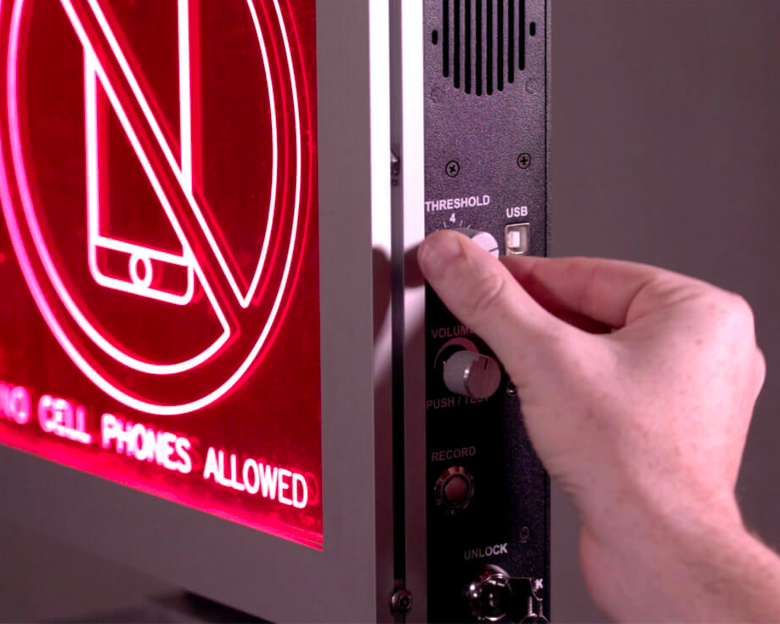 Once detected, WallHound™ alerts the mobile phone user (and anyone else within earshot) with a bright, flashing LED ‘no mobile phones’ sign and loud, custom audio message set by the facility. Sensitivity and alert volumes are fully adjustable and also key lockable to ensure no tampering occurs. WallHound’s strength lies in its ease of use and ability to function fully unattended. 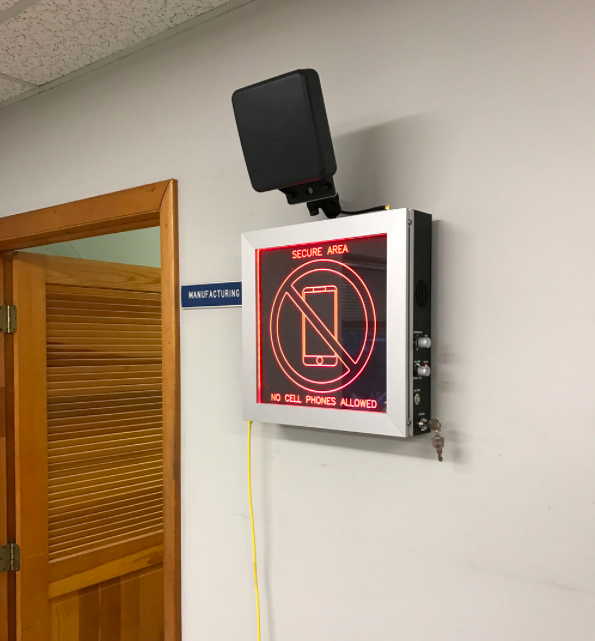 The WallHound frees up security personnel for more pressing duties while reminding visitors that mobile phones are prohibited, making WallHound ideal for visitors in correctional facilities, court rooms or anywhere people need to be reminded about mobile phone policies. Does WallHound identify callers or their phone numbers? How far away can I detect cell phones? Typical range is about 75 feet but this varies depending upon the environment, placement/installation of unit and the use of an optional direction finding antenna compared with it’s internal omni-directional antenna system. Can I detect phones in standby mode? WallHound can detect phones in the standby mode but keep in mind when a phone is ON in standby, it is not constantly transmitting. Phones register to the local cell tower/base stations at different intervals that the tower/carrier determines (could be every few seconds, minutes, and we have seen up to 20 minutes). When a phone registers, it is a short pulse of less than 1 second so the WallHound might only flash once and play the audio alert once instead of continually. Can WallHound be networked to other devices or security systems? WallHound does not contain any wired or wireless networking hardware such as an ethernet port but it does contain a USB port for connection to a PC for configuration. WallHound also includes dry contacts that allow it to be triggered from other detection devices such as our SentryHound-Pro.